There are not many gliders, which have survived the Second World War. Indeed this type of aeroplane is absolutely irrelevant for current warfare – apart from some sporadic use of some glider types for pilot training. However, the occupiers confiscated everything that could fly and the victors who followed them did the same. The rest was done by the many air raids, which have also destroyed the aviation museums. Many of these machines (gliders) had been built in small numbers were lost forever. 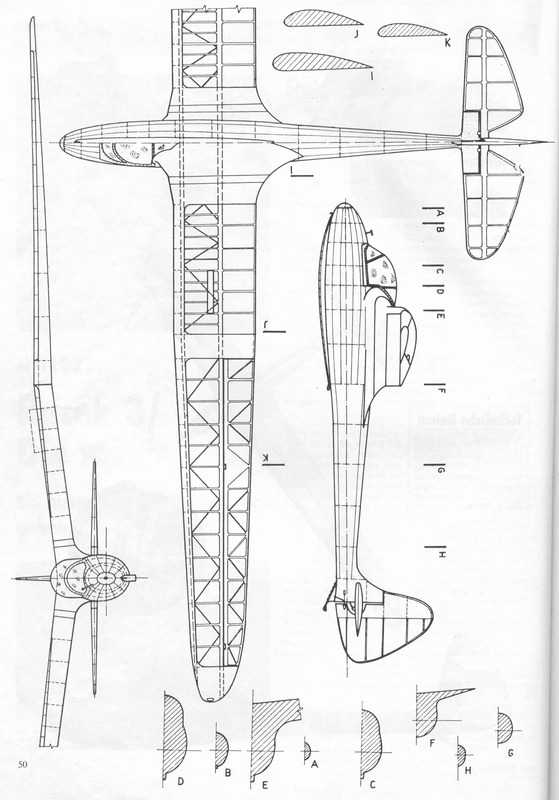 One of the nicest and most interesting constructions of a Czehc glider in the 1930s luckily escaped this destiny. The glider survived the war, dismantled into pieces and wrapped into wrapping paper, hidden a garage in a derelict brewery. While the designer Kuklik was still alive it was possible to compile this scale-documentation and the plans for the model. Everything started in the heads of youngsters and young men with an enthusiasm for flying which you can hardly find nowadays. Todays passengers travelling in jets was, from the aeronautical point of view, not more exciting than a river cruise and seems to have lost the magic of the adventure flying. The 1930s were the years of the aeronautical boom. The aeroplane technology was already safe and reliable, the plane as a sports equipment was affordable, at least when you built it yourself. A group of young men from Prague were always dreaming of flying, inspired by the blue and endless sky. After many models the first sketches on a huge sheets of paper for a “real” glider began in a small room as well as gluing and nailing of ribs. Soon they reached the limits of a small apartment and the parental patience. The first components showed a good craftsmanship and therefore a haulier was convinced about their seriousness and offered them his stables for a small fee. (They were stables, not garages; the haulier’s lorries had exactly 1 hp ). In June 1934 the first Racek 1 or the Möwe 1 was completed and was transported to a military training area nearby. In the following months the aeroplane builders developed into pilots, but still required their craftsman skills after many crash landings. Everybody managed to obtain their B-licence on their “Möwe” which flew until 1936. Back to the third Möwe, “Racek 3”. F. Kantor, then 18 years old, wrote about the construction: “I was employed as window decorator in a draper’s shop. I came home around eight thirty in the evening, though my working hours finished earlier. None of the employees dared to leave work first only to avoid a bad reputation with the shop owner. And that I was building a glider; I had to keep a secret. The colleagues and employer did not have an understanding for such a hobby. I only had the nights, Sundays and holidays left for my glider.” Until the spring of 1937, F. Kantor worked on his own, and then another known glider pilot K. Kuklik joined him. While K. Kuklik was unemployed he spent all day in the workshop while Kantor earned the money. The money wasn’t quite enough and therefore he borrowed a big sum of money from his boss of the draper’s shop. 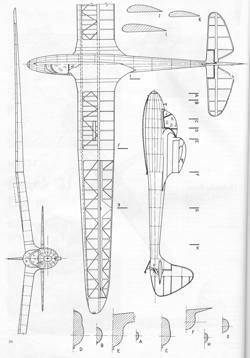 In the summer of 1937 the glider was ready for painting. The wings and tailplane rudder were kept in the natural colour of the linen, the fuselage was red. The red was the reason while the pretty glider quickly became nicknamed the “Carrot”. The Möwe made its maiden flight in October 1937, towed behind a military Aero A-111 and with the experienced test pilot S. Rodovsky at the controls. The unemotional report from the flight must have lifted the pride of the constructors. A smooth flight was reported, balanced steering, and minimal forces on the controls. Overall only positive things were reported. The more than 5000 working hours and 800 Kronen which had been spent were worthwhile. After that the “Möwe” was flown extensively, winning some competitions and experienced a few crash landings. After the last crash landing the glider disappeared into a hiding places in Prague – the war had just started. After the glider had been secretly repaired it was wrapped up in wrapping paper and stored. Only model gliders were allowed to be flown during the war perod. 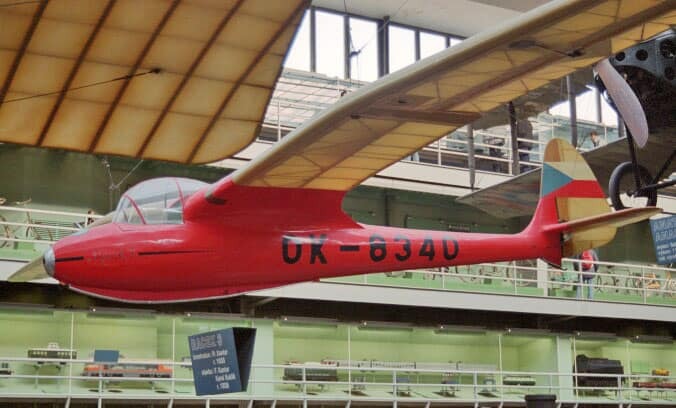 After the end of the war the “Möwe 3” was soon back in the air and was flown until 1951 before the glider was handed over to the technical museum in Prague. The Möwe then had to wait for repairs and was kept in the museum cellars until about 1965 until the repairs were made. The Möwe was then given its place in the public part of the museum where it hangs today.